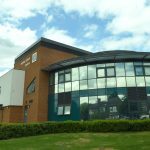 The Acklam Green Centre has a packed calendar of activities that take place each week, ranging from Slimming World groups to meditation and mindfulness sessions and performing arts classes. We’ve produced a handy new timetables so that members of the public can find out what’s happening here in their local community with ease. If you’re looking for a base to run your activity; whether it’s a fitness class, art class or something completely different, we still have plenty of slots available throughout the week and our versatile space means we’re confident we can meet your needs. To enquire, get in touch via 01642 811137. The Acklam Green Centre has welcomed two new members of staff to its in-house catering team. Melanie Owen has joined the Middlesbrough based business and community centre as full-time café/ catering supervisor bringing over 25 years’ experience in the catering industry to the role. 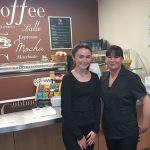 Melanie, who lives in Middlesbrough close to Acklam Green Centre, has spent most of her career in a school environment, most recently at Macmillan Academy. She is now responsible for running a busy kitchen and coordinating the catering service for clients of up to 150 people using the centre for business meetings, conferences and events, as well as running Café Connect, which is open to the public as well as staff and tenants based in the centre. Megan Coakley has also joined the team as café/ catering assistant to support with an increased demand for café and catering services on weekends. Megan will undertake the role on a part-time basis while studying for her A-levels at Macmillan Academy. 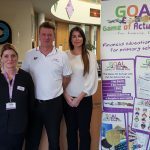 The appointments coincide with an enhanced catering offer from Café Connect which has extended its catering menus in recent menus and has reinforced its commitment to the promotion of healthy eating, resulting in the business being awarded Middlesbrough Council’s Food4Health Gold Award. The Acklam Green Centre has received an award for its contribution to the health and wellbeing of local people. 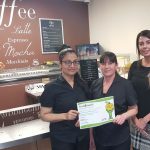 Café Connect, located in the atrium of the Middlesbrough based business and community centre, has been awarded Middlesbrough Borough Council’s Food4Health Gold Award which recognises and rewards food businesses that offer healthy food options and promote healthy eating. The awards consider the types of foods and ingredients used by restaurants, cafes and other venues where food is consumed, such as school and college canteens, across the Borough. Food4Health also takes into account how food is prepared and cooked, and how the business goes about promoting their offer. Café Connect provides catering menus for clients using Acklam Green Centre’s meeting and events facilities and it also provides an eat-in and take-away service for the centre’s tenants and members of the public. Over the past few months it has reinforced its commitment to healthy eating by switching to low salt, cutting out dressings, using low fat products such as mayonnaise and margarine instead of butter, offering small portions and using spray oils and low fat milk. The changes follow the introduction of revamped menus in January and a three month period where customer feedback was encouraged, which also influenced the changes. At the end of 2016 both the Acklam Green Centre and its sister venue the Resource Centre, which also benefits from Café Connect’s catering offer, became ‘breastfeeding welcome’ venues which also helped contribute to the award. Donna Smith, facilities manager at Acklam Green Centre, said: “We already had good menu offerings for both the café and in-house catering but in line with the award guidelines and in response to customer feedback we have now added some healthier options to give people a choice. Laura Kemp, Public Health Officer at Middlesbrough Council, who oversees the Food4Health programme, said: “The Gold Award recognises the commitment made by food outlets to ensure the food available is nutritionally balanced, allowing customers to make fully informed food choices. Food4Health comprises three awards: Bronze, Silver and Gold. Each award considers the types of foods and ingredients used, how food is prepared and cooked, and how the business promotes healthy eating. Awards are free and businesses working towards achieving an award receive advice and support on nutrition and healthy catering practices. The Acklam Green Centre welcomed over a hundred children and young people from 11 local schools for a performance of William Shakespeare’s ‘The Tempest’. The Year 1 to Year 10 pupils, aged five to fifteen, are from the Middlesbrough Associate Schools. The group comprises of: Archibald Primary School as Lead School, Abingdon Primary School, Acklam Grange School, Acklam Whin Primary, Berwick Hills Primary, Breckon Hill Primary School, Newport Primary School, Macmillan Academy, Priory Woods School and Arts College, St Thomas More RC Primary and Thorntree Primary. 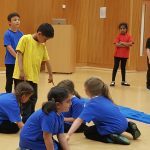 As part of the Royal Shakespeare Company Associate Schools Project, which is aimed at embedding Shakespeare in education, the participating schools each brought to life a section of the 400 year-old comedy, set on a remote island and revolving around a major act of betrayal and a plot of revenge. The young thespians took part in two performances to packed audiences in Acklam Green Centre’s large conference hall. 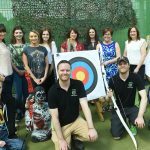 The Acklam Green Centre offers versatile facilities ideal for business events, conference and meetings as well as a base for many community and activity groups. 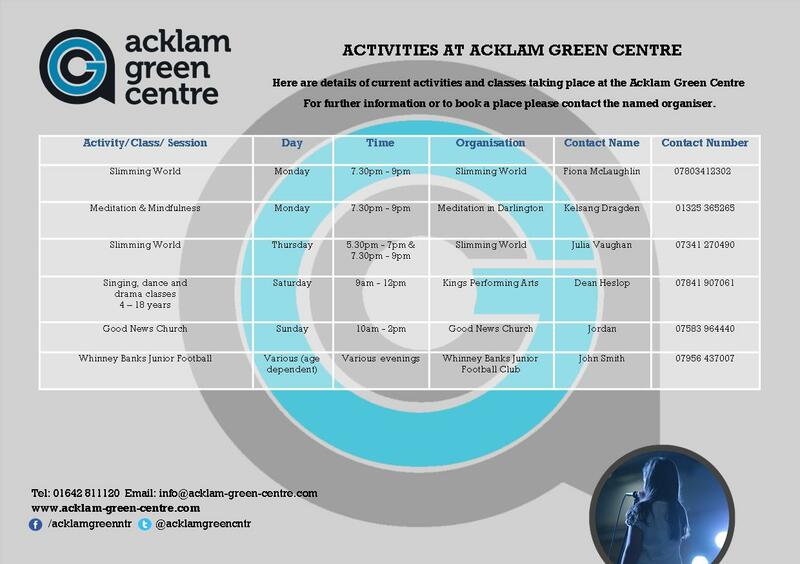 For further information about the Acklam Green Centre contact 01642 811 121. Café Connect is marking this Mother’s Day with a special afternoon tea event taking place on Monday 27 March. Located within the Acklam Green Centre, Café Connect will be serving a traditional afternoon tea comprising of a selection of finger sandwiches, savoury and fruit scones served with preserve and whipped cream, homemade cupcakes, tray bakes and a choice of tea, coffee or herbal tea. Priced at £6.50 per person or £12 for two, the afternoon tea event is a chance to treat mum just after mothering Sunday on 26 March. The event follows the introduction of afternoon tea to the Acklam Green Centre delegate catering packages which have been well received since they launched last month. Paula Baxter, Café Connect supervisor, said: “Everyone loves an afternoon tea, especially on Mother’s Day, so we have decided to mark the occasion by hosting an event on Monday 27 March so people can treat mum or other special ladies in their life. 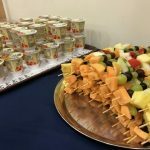 “We recently introduced afternoon teas to AGC’s delegate catering packages which have proved very popular, so it made sense to make this available to the wider public. The Mother’s Day Afternoon Tea will be served between 1pm and 3pm on Monday 27 March and places must be booked in advance by Wednesday 22 March, 2017.